Built as a palatial private residence for a wealthy businessman during the 1920's and 1930's, Scotty's Castle can be described as the 'Hearst Castle of the Desert' or a desert Xanadu. 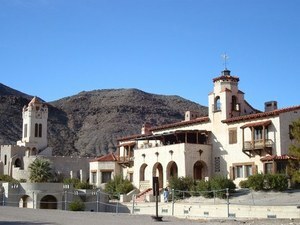 The National Park Service offers two different guided tours of the Scotty's Castle - one for the above ground floors and one of its basement and hydro power station. One of the most remarkable aspects of this large estate is how technologically advanced and self-sufficient it was for its day. There is a book store and separate gift shop and café on site at Scotty's Castle. Only accessible from the direction of Beatty from State Route 374, the Titus Canyon drive is one of the most spectacular off road drives in the entire U.S. and is recognized by many 4x4 enthusiast clubs as just that. The road up to and down through Titus Canyon is 26 miles long and hosts a extreme sports Marathon every year. The road is well maintained but does require a four wheel drive vehicle due to some high clearance areas. Get ready to drive through a deep narrow canyon which displays thousands of layers of earth history going back700 to 800 hundred million years, a real geology lovers paradise. 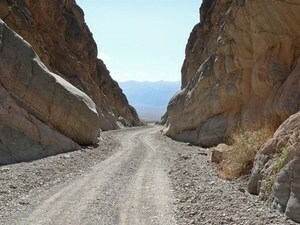 The road is open from Hwy 374 - in a one way only direction only - into Death Valley for most of the year. Snow at the top of a pass or overly wet conditions can cause the road to be closed for periods from mid-November to mid-January each year. You can sign up for a guided tour in a 4 wheel drive vehicle at the front desk at the Atomic Inn. It's a 3 to 4 hour tour which features stops at 2 ghost towns, an outdoor sculpture museum, a bag lunch and of course the tour through Titus Canyon.